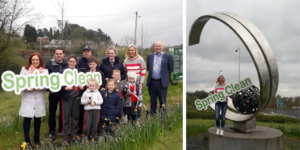 Cathaoirleach David Maxwell, along with National Spring Clean Ambassador Sarah McGovern Vaughan and students from Gaelscoil Ultain, officially launched the 2019 National Spring Clean in County Monaghan. Over the past 21 years, The National Spring Clean has focused on the collective responsibility we share in tackling and preventing our national litter problem. Participating in organised clean-ups is an opportunity for groups and individuals of all ages to make a meaningful and positive contribution in their own communities. This year, the initiative wants to raise awareness about another crucial issue: the link between litter and climate change – the biggest environmental challenge of our time – and highlight how combined local actions can have a global effect. ‘Despite the great work by the Spring Clean, litter pollution remains a problem. And yet litter is one of the most easily solvable of our environmental problems. While the link between litter and climate change might not be immediately obvious, the two are connected. When waste goes to landfill, it generates methane, a gas which is approximately 30 times more potent as a GHG than CO2. For this reason, reducing waste is more important than recycling, and adopting sustainable consumption patterns is of the utmost importance. Today, I am calling on local residents, community groups and businesses to volunteer their time and energy in the fight against litter. In the spirit of volunteerism, The National Spring Clean 2019 aims to build a sense of collective responsibility to environmental protection through community participation. Collective responsibility at a local level can influence positive change’. All clean up groups registering with the National Spring Clean campaign receive a FREE clean-up kit comprising information, posters, colour coded refuse sacks for segregation of waste materials, protective gloves and tabards to keep participants clean! Groups registered with National Spring Clean are covered under a public liability insurance policy while engaged in clean-up activities for the duration of the campaign. An Taisce encourages everyone taking part in ‘#springclean19’ activities to tell everyone about it. Post photos using the #SpringClean19 hashtag to your favourite social media platforms. You can tag the campaign on Twitter or Instagram using either the twitter handle @NationalSpringC, and on Instagram using the Campaign’s Instagram handle @nationalspringclean.